This comprehensive training/education package focuses on the major engine systems affecting engine performance and drivability. 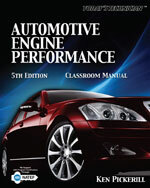 TODAY'S TECHNICIAN AUTOMOTIVE ENGINE PERFORMANCE, 5TH EDITION includes thoroughly updated content on ignition systems, intake and exhaust systems, fuels and emission controls and related electronics, in two comprehensive manuals. With a sharp focus on current technologies and the inclusion of outstanding learning features, this new edition provides an excellent classroom resource for students preparing to become future technicians. Content updated to the 2008 NATEF Standards for Engine Performance. FOCUS ON ELECTRONIC CONTROLS: An increased focus on electronic controls emphasizes the importance of today's technologies. FULL COVERAGE OF CURRENT STANDARDS: The text fully covers, and is correlated to, ASE certification area A8 and the NATEF area for Engine Performance. ASE STYLES QUESTIONS/PRACTICE EXAMS: ASE style questions and an ASE practice exam in the Shop Manual help to prepare readers for certification. SUPPLEMENT PACKAGE: A robust supplement package offers instructors all they need to save time, enhance lectures, and keep students engaged!